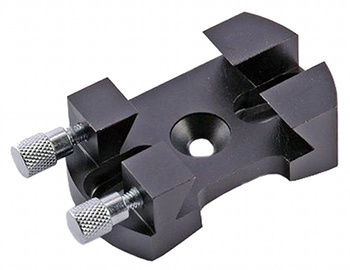 The Baader Universal Quick Release finder base (finder-shoe) is compatible with most standard finder brackets and some red dot finders. The base can also be used as an additional base on telescopes that don't already have a finder shoe in a convenient position. CNC machined with a curved base and elongated holes for a good fitting to almost any telescope, including Schmidt-Cassegrains (SCT). The Baader finder base has two elongated holes for screws up to M5, with either a countersunk head or a flat cylindrical head. Spacing between the screws is 27-45mm. In addition the base has a central countersunk hole for screws up to M5. Screws and nuts are not included.